Cardiologists on the medical staff at Baylor Jack and Jane Hamilton Heart and Vascular Hospital (BHVH) today implanted an investigational cardiac pacemaker the size of a multivitamin. The first implantable pacemakers, developed in the late-1950s, were nearer the size of a transistor radio. Cardiologists on the BHVH medical staff implanted the world’s smallest pacemaker, the Medtronic Micra™ Transcatheter Pacing System (TPS) as part of a study by Medtronic. 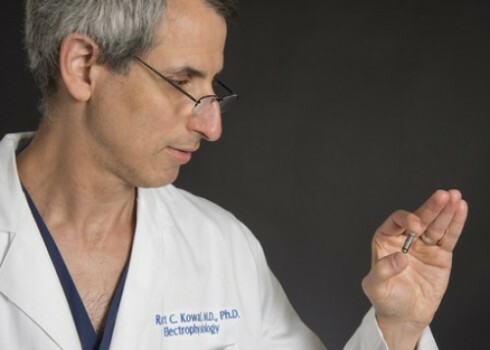 “This is an investigational device that could be a game-changer because of its size and the technology housed inside of it,” says Dr. Robert C. Kowal, MD, PhD, principal investigator for this trial at BHVH. Fifty institutions around the globe are participating in the trial. One-tenth the size of a conventional pacemaker, the Micra TPS is delivered directly into the heart through a catheter inserted in the femoral vein (groin). Once positioned, the pacemaker is securely attached to the heart wall and can be repositioned or retrieved if needed. “This miniaturized technology is designed to provide patients with the advanced pacing technology of traditional pacemakers via a minimally invasive approach. In the past, we made a surgical incision in the chest and created a ‘pocket’ under the skin where we placed the pacemaker,” explained Dr. Kowal. “This one is placed inside the heart via catheter.” This eliminates a potential source of complications, and any visible sign of the device, he said. Pacemakers are the most common way to treat slow or irregular heart rhythms. A pacemaker helps restore the heart’s normal rhythm and relieve symptoms by sending electrical impulses to the heart to increase the heart rate. The miniature device does not require the use of wires, known as “leads,” to connect to the heart. It is attached to the heart via small tines; and then the pacemaker delivers electrical impulses that pace the heart via an electrode. “We are proud that Baylor Heart and Vascular Hospital in Dallas was selected among an elite group of institutions to take part in this clinical trial. If positive, the results of the trial could potentially benefit the more than 1 million people globally who receive pacemakers each year,” said Nancy Vish, PhD, RN, FACHE, president and chief nursing officer of BHVH.